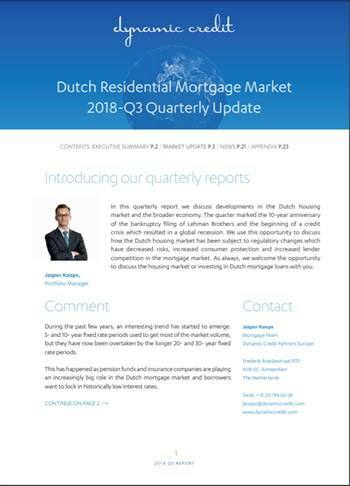 In this quarterly report we discuss developments in the Dutch housing market and the broader economy. The quarter marked the 10-year anniversary of the bankruptcy filing of Lehman Brothers and the beginning of a credit crisis which resulted in a global recession. We use this opportunity to discuss how the Dutch housing market has been subject to regulatory changes which have decreased risks, increased consumer protection and increased lender competition in the mortgage market. As always, we welcome the opportunity to discuss the housing market or investing in Dutch mortgage loans with you.